Making a ham for your holiday dinner does not have to mean monitoring your work for hours. Using this recipe, your pressure cooker and broiler work together for a deliciously juicy ham covered in a sweet glaze that is sure to please everyone at the dinner table. Who would ever guess that the centerpiece for your holiday meal could be made in a MultiPot in just half an hour! Less time in the kitchen means more time with friends and family and that's what the holidays are all about! Stir apple cider, honey, maple syrup, brown sugar, orange juice, pineapple juice, cinnamon, nutmeg, and cloves together in pressure cooker set to Sauté on Normal; cook, stirring frequently, until sugar and spices are dissolved and the sauce is warm. Gently lay ham into the sauce. Lock pressure cooker lid in place and turn steam vent handle to Sealing. Select Meat/Stew and cook for 10 minutes on High pressure. While ham cooks, preheat your oven’s broiler. Line a baking sheet with aluminum foil. Remove ham from cooker to prepared baking sheet. Press Sauté on pressure cooker. Cook liquid remaining in the pot until you have a thick and syrupy glaze, 4 to 6 minutes. Bake glazed ham under preheated broiler until glaze is caramelized, 3 to 5 minutes. Transfer ham to a cutting board to slice. Arrange on a serving platter and drizzled glaze over the ham to serve. Cinnamon, nutmeg and cloves are a magical blend of spices that smell and taste like the holiday season. Just make sure you are using spices that haven't been sitting the back of your cabinet for the past 5 years! The flavor diminishes over time. Per Serving: 115 calories; 1g fat; 24.1g carbohydrates; 4g protein; 11mg cholesterol; 168mg sodium. 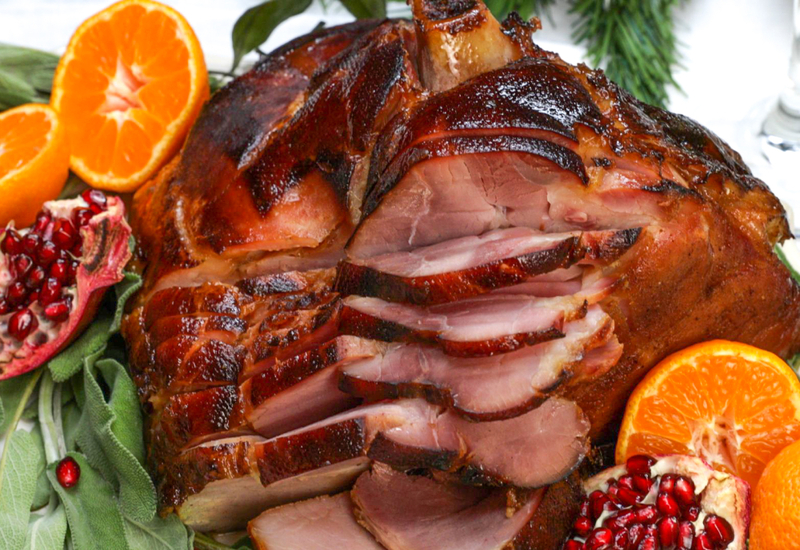 Nothing says the holidays like a delicious ham! This recipe was perfect, and also an excellent choice for even an amateur cook. The sweet glaze was so flavorful, and paired well with the cinnamon, nutmeg, and cloves spices. This recipe is great for any holiday, from Thanksgiving to Christmas to Easter. I made this ham with the maple glaze and it was amazing. The pressure cooker makes it super easy to prepare and also cleanup in a cinch. Because the ham actually cooks in the liquid, the flavor penetrates deep and gives it incredible flavor, leaving the ham is most and juicy. This is one of those recipes you'll want to save and make again and again. This ham reminds me of my grandmother's famous recipe! Nobody does it like her, but this was pretty close. I'm making this again for Christmas. This was really easy and turned out great. I am no chef, so the thought of making a ham for the holidays was a little intimidating. Thanks to this recipe I nailed it and impressed my boyfriends family. Thanks! Holiday, schmoliday. Made this for a Sunday dinner with the extended family & it was perfect. Best part was having plenty of leftovers for sandwiches during the week. The glaze is going to drive you crazy, but don't eat it all! Use as directed and enjoy in moderation. So good.